The bustling Pilbara gold rush has been one of the most high-impact stories to trend in the mining and resources space over the past year. With companies like Novo Resources (TSXV:NVO), De Grey Mining (ASX:DEG) and Artemis Resources (ASX:ARV) all reporting game-changing conglomerate-hosted gold discoveries here, the Pilbara — a region that has traditionally been more synonymous with iron ore — has sparked fervour from ASX explorers and investors alike. Just ask fast-moving ASX junior, Kairos Minerals (ASX:KAI), which last month revealed a considerable JORC Mineral Resource increase at its Pilbara Gold Project from 258,000 to 643,000 ounces of gold. This project sits 90 kilometres south-east of Port Hedland in the west Pilbara region, in the world-class Pilgangoora district. KAI holds some 1,158 square kilometres of tenure here that is highly prospective for conglomerate-hosted gold discoveries. This latest piece of news, which certainly seemed to pique shareholder antennae, saw KAI more than doubling the contained gold at its major Mount York deposit, which now sits at 486,000 ounces. Several successful maiden drilling programs completed late last year have confirmed that the zone of BIF-hosted gold mineralisation at Mt York is continuous between the previously mined Breccia Hill and Main Hill shallow open pits, and extends for at least a further one kilometre to the east to Gossan Hill. 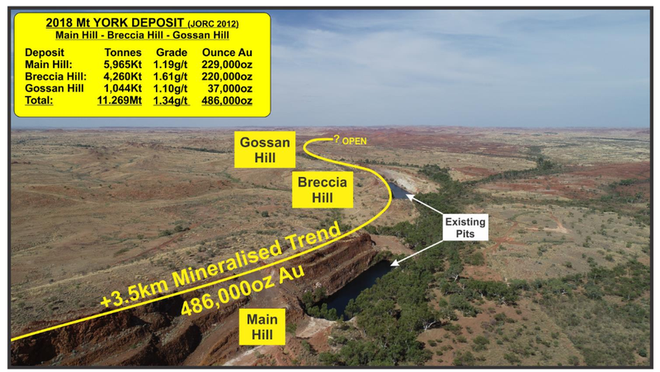 Intriguingly, these three prospects — Main Hill, Breccia Hill and Gossan Hill — are all part of a single continuous gold mineralised system, rather than a series of separate ‘pods’ as previously thought. The Resource also remains open in most directions, so there’s potential to add further ounces both along strike and at depth — including the opportunity to target higher grade zones at depth. This translates into considerable exploration upside for KAI. A new drilling program has kicked off to follow up these kinds of opportunities and to pave the way for further Resource upgrades. All of this makes for crystal-clear evidence that KAI is swiftly emerging as a heavyweight player in the globally significant Pilbara area. Although KAI does remain a speculative stock and has a long way to go before it can be called a heavyweight and investors should seek professional financial advice if considering this stock for their portfolio. In a different part of WA, some 20 kilometres east of Kalgoorlie, pleasing news has also come out KAI’s Roe Hills Gold Project. After beginning a focused drilling campaign in late February, KAI soon reported it had found an expansive gold system. Results indicate shallow and widespread gold mineralisation across Roe Hills, encompassing 324 square kilometres of landholding and 40 kilometres of continuous strike. Some of the most impressive intersections include 35 metres grading 1.05 grams per tonne gold and 11 metres grading 1.10g/t at the at the Terra prospect, with Caliburn giving up 54 metres grading 0.74g/t gold with a 2 metre interval grading 6.43g/t gold. Roe Hills sits immediately along strike to the south of Breaker Resources’ (ASX:BRB) emerging Lake Roe gold discovery and adjacent to $304.8 million Silver Lake Resources’ (ASX:SLR) Aldiss gold project. Encouragingly, KAI is continuing to find more gold with every drilling program (this is its third). At the same time, it’s also gaining a deeper understanding of the region’s geology, which will play a central role in its campaign to establish a maiden gold Resource for Roe Hills. 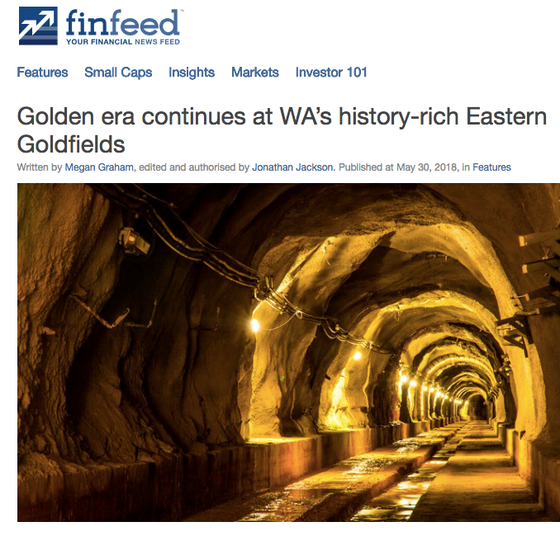 All in all, 2018 looks like it’s shaping up to be an auspicious year for this WA-focused gold explorer, with plenty more still to come. KAI is also in a comfortable financial position, with $8.2 million in cash reserves reported in its last quarterly, which will give it a solid platform to realise its exploration initiatives. These are still early days, but KAI is already making itself known as a formidable WA gold player. This aspiring gold-miner is currently capped at a modest $33.5 million, with strong potential for more in the way of rapid growth. 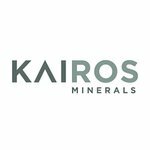 We last caught up with Kairos Minerals (ASX:KAI) with the article, ‘KAI Takes a Prime Position in the New Pilbara Gold Rush’ — a title that speaks for itself. In that piece, we looked at the dynamics and drivers of the current Pilbara gold-rush, including the geological style of discoveries that are being made — specifically, the conglomerate-hosted, Witwatersrand-style gold KAI has found, which is also the type discovered by Pilbara forerunner, C$753 million-capped Novo Resources alongside partner Artemis Resources. We also took a look at KAI’s position as an emerging central player within this then-new Pilbara gold movement as the region rapidly attracts (and continues to attract) significant attention for its gold potential. KAI’s 100%-owned Pilbara Gold Project is situated 90 kilometres south-east of Port Hedland in the Pilgangoora district, immediately adjacent to the major lithium-tantalum projects owned by $1.5 billion-capped Pilbara Minerals (ASX:PLS) and $664 million Altura Mining (ASX:AJM), both of which are currently in advanced stages of construction and development. 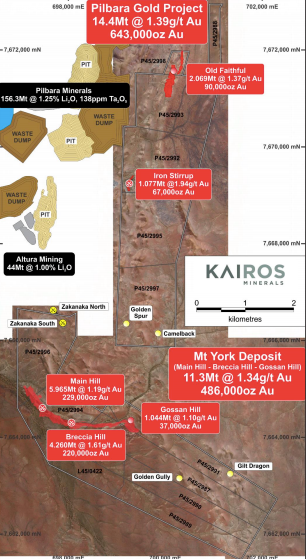 Kairos snapped up the Pilbara Gold Project back in mid-2016, and wasted no time in laying down a maiden JORC Resource for the key Mt York deposit of 135,000 ounces contained gold, based on a comprehensive assessment of the historic work and reinterpretation of the geology. Only three months after that, KAI amplified the Mt York Resource to 258,000 ounces. This track record of expedient work makes the most recent KAI news to come out of the Pilbara unsurprising — but no less impressive. 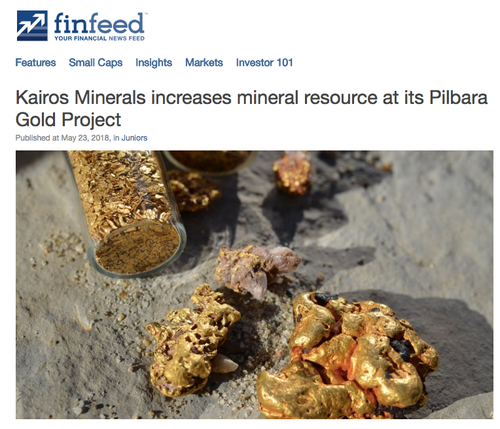 As we touched on earlier, last month KAI revealed it has boosted the overall gold Resource at the Pilbara Project — an investor-pleasing piece of news. The significant increase stems largely from the reinterpretation of the deposit geology based on results from the highly successful extensional drilling program completed last year. The Resource for these centrally located deposits, including Mt York, Iron Stirrup and Old Faithful, brings the global Mineral Resource estimate at the Pilbara Gold Project to 14.4 million tonnes at 1.3g/t gold for 643,000 ounces of contained gold. Breaking this down further, the updated Indicated and Inferred Mineral Resource estimate for the Mt York Gold deposit is 11.3 million tonnes grading 1.34g/t gold for 486,000 ounces of contained gold, which represents a 290% increase in contained gold over the previous Resource estimate. This makes for very clear verification that KAI’s Pilbara asset is emerging as a noteworthy new WA gold project. Although there KAI still has a lot of exploration work to conduct so investors should take all publicly available information into account before before making an investment decision with regard to this stock. 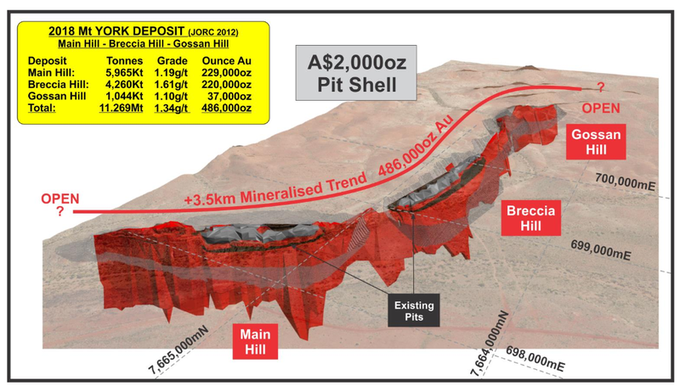 The Main Hill, Breccia Hill and Gossan Hill deposits are now confirmed as a single continue gold mineralised system that extends over 3.5 kilometre of strike — this is now described as the Mt York gold deposit moving forward. Each of the deposits remain open along strike and at depth, providing salient opportunities to further increase the Resource and target higher-grade mineralisation at depth. A new major drilling program has now kicked off at Mt York to test the potential for further extensions to the mineralised zone and undertake additional in-fill drilling. Given KAI’s quick-footed work in doubling its Resource via focused, cost-effect exploration, there’s little doubt that it can now continue to grow it rapidly, establishing a gold project of considerable scale. The remainder of 2018 is looking busy for KAI as it amplifies its Resource and uncovers more in the way of golden possibilities, upholding its status as a significant player in the Pilbara gold space. And given the scope for exploration upside, this is a growth story that could very well continue expanding. KAI is also in a strong cash position to move forward, with $8.2 million in the bank. It’s still early days yet for this ASX gold junior, so investors should seek professional financial advice if considering this stock for their portfolio. KAI is currently valued by the market at a humble $33.5 million. 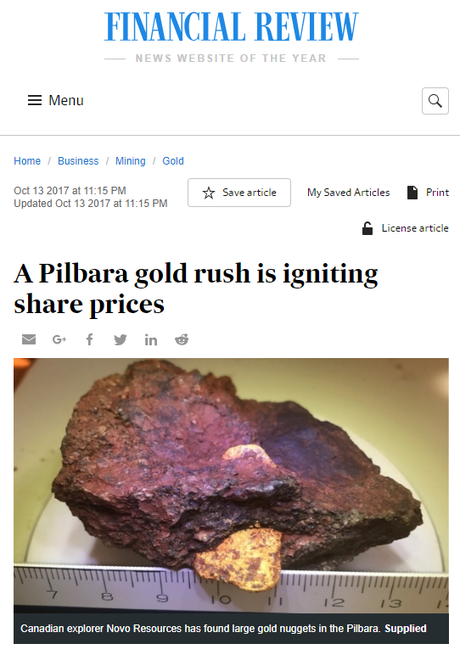 Yet considering the Resource upgrades it’s deftly engineered since first acquiring the Pilbara Gold Project two years ago, we have no doubt that this strategic gold explorer will be able to take things to the next level in the months to come.